SKU: 10074151 18" x 13-3/4"
Available only at The Container Store, our Angled Solid Metal Shelf offers the perfect solution for shoe storage! Designed to hold shoes, it can also be used in libraries and home offices to display books and magazines. The edges have lips to keep items in place but don't block your view. These shelves are perfect for storing more shoes in a vertical (and more visible) space. Add Fascia to your shelves by using our new Elfa Fascia Clips for Angled Shelves. Clips will automatically be sent free of charge when creating a new space. For a 3' shelf you will need to use two 18-inch pieces of Fascia. If you'd like to add Fascia to existing Angled Solid Metal Shelves, please contact us at 1-888-CONTAIN (266-8246) to ensure you are sent the correct amount of clips. Platinum Elfa Angled Solid Metal Shelves is rated 5.0 out of 5 by 20. Rated 5 out of 5 by Happyplace from New Elfa closet. So happy! 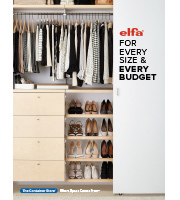 Recently installed an Elfa closet system in our master bedroom walk in closet. I love how organized and visible things are! Rated 5 out of 5 by erm423 from Life saver! I absolutely fell in love with these shelves for my new shoe wall design; and they are perfect! Great space saving solution for shoe storage, and they look amazing! Rated 5 out of 5 by javajane from Better than Shoe Shelves - if You Favor Flats I have the hanging shoe shelves for my ELFA closets; however, since most of my shoes are flats and wedges, they fall off the shoe shelves when I pull them out. Angled metal shelves have solved my problems. The shoe shelves are great for heels tho. Rated 5 out of 5 by Summerjoy from My elfa shelves rock and my shoes stay organized! These Angled Solid Metal Shelves are a perfect new addition to my elfa bedroom closet design. I was not using the area to hang blouses and, voila, I have reclaimed the space for storing my shoes. I hooked the shelves into the existing supports without the aid of a handyman. Elfa components rock! Rated 5 out of 5 by NanciB from Laundry Room This review is really for the entire Elfa Closet Shelving System. About a year ago I remodeled my laundry room. After much research I decided on the Elfa Shelving System. I chose the Platinum track, hanging standards, ventilated shelves, utility board and accessories, and the angled metal shoe shelf (which I love - see photo). For the solid shelving (which I use as a folding table) I chose white along with the white Fascia for the ventilated shelves. I highly recommend the Fascia as it gives my laundry room a more finished look. A year later and I'm still so pleased with my choice of the Elfa System. Rated 5 out of 5 by OC220 from While I loved the metal shelves, they did not work for me as my closet unit is out of date, some items are obsolete and most brackets will not work. However, I hired a Container Store Consultant to come out and refigure my closet for me. Can't wait for the finished product. Thanks. Rated 5 out of 5 by MrsShoe from You need this shelf Fits my husband's shoes and keeps them from becoming a jumbled mess. When one of the shelves arrived damaged from shipping (looks like delivery guy dropped the box on a curb, not the CS's fault), they immediately corrected the problem and sent us a replacement. I will be buying more of these from them soon! Wonderful customer service! Rated 4 out of 5 by Shoegurl from Love these BUT... These racks are great, I replaced my flat shelves with these since I thought they'd be more in line with the way I wanted to display my shoes. i have these shelves in 2 ft and 3 ft. the shelves look great the problem I found is that shoes that have a platform in the front will fall off the shelves. Shoes that are heavy will slide forward and fall off the racks. I have lots of shoes so it took trial and error to determine which ones will stay on the racks and which ones will fall off. i think a solution would be if the shelves had some type of liner to prevent the shoe from sliding forward and falling off. Rated 5 out of 5 by patty001 from Mud Room This is my first Elfa purchase and I Love it. The shelves are great, material is sturdy and it looks good. We had been looking for a solutions for awhile and found it. Rated 5 out of 5 by ConStoreShopper from Excellent Shelves I really love these angled shelves. They're lightweight, easy to move around, and store shoes so that they're both easily identifiable and accessible. These shelves, along with all of the other Elfa components, has made our mudroom/entryway so much more efficient and organized. I also love that the Elfa shelving utilizes all of the available vertical space for maximum storage capacity. Rated 5 out of 5 by Maillady from Best purchase ever!!!!! Before purchasing this shelf I kept my shoes in the original box. I had to search thru boxes to find the shoe I wanted now I feel like I have my very own shoe store!! I LOVE IT!!!! Rated 5 out of 5 by ajeant from Great addition to ELFA line Love this shelf. It is great for shoes (flats and heels both work great) and also is good for display as well...books, scarves, etc. all sit nicely on this sturdy shelf. Rated 5 out of 5 by shopper5150 from Great idea I first bought the the rounded metal shoe racks and while they work great for heeled shoes there must be a definite heel for the shoe(s) to stay put.. When I saw these shelves thought perfect to replace the other racks. And they are! The Elfa system makes it so easy to change designs and these new shelves hold all styles of shoes and they are easy to view. I get 3 pairs of shoes per rack. I also bought the 24" closet rod to attach at the bottom (using a wire shelf) to hang my boots. do i need to buy the brackets which are attached to the wall, from which the shelves hang? i do not understand what is meant by &quot;integrated bracket&quot;. No. The shelves have small brackets made into them that allow you to hang them directly on the Elfa Easy Hang Standard. They fit into the slots on the standards. When calculating how many shelves I can fit, how much height do I need to factor in for the shelf itself? Later, I'll add in the height of what I want to store, but I don't know how steep the angle is and, consequently, how much vertical space I need to allow per angled shelf. For flats, I used 8&quot; for each shelf. The shelf takes 2; with 6&quot; between each shelf. What brackets do I buy for the 3&quot; shelves? No additional brackets are necessary. The shelves are made with brackets that fit into the slots on the Elfa Easy Hang Standard. How far apart in height do I space them? I have a vertical area that is 36&quot; in, how many shelves will fit? Honestly, it depends on the height/type of the shoes on the shelf. If you're storing flats, you can have them closer together than if you were storing ankle boots/booties with heels. Can these shelves fit into a closet that is 9&quot; deep? What is the depth of the shelf? What is the degree of the angle downward? No, each of our elfa Angled Solid Metal Shelves is 13-3/4&quot; deep from front to back - too deep for the measurements provided. Which width of elfa does this fit? Elfa drawers/shelves have two widths and I have the narrower width. Do these come in the narrower width or are they only for the wider elfa? The Platinum elfa Angled Solid Metal Shelves come in widths of 24&quot; and 36&quot;. We do not carry an 18&quot; option at this time. Can these be mounted side by side? If so, will it give it give a continuous surface so shoes can slide across/span the seam? I want a 48&quot; wide surface. Yes, you can mount them side-by-side for one long continuous shoe shelf. What is the weight capacity of these shelves? I have aspirations of using the these shelves for drum machines and desktop synthesizers in the studio and wonder if 20-30 lbs per shelf would be safe.